Buck's Pizza franchise business opportunity. Free Buck's Pizza business franchise information. 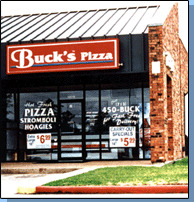 Buck's Pizza Franchising Corporation, Inc. is the franchisor of carryout and delivery pizza shops that offer pizza, strombolis and hoagies. The low cost and low overhead principles that Buck's Pizza® adheres to, have proven to be an important ingredient for success. After you've been awarded a franchise, Buck's Pizza® will assist in identifying a market and assist you in your site evaluation. When it comes to pizza, we never cut any corners. It is a source of pride that what we prepare is always superior quality. To serve the best food, we buy only the best ingredients and prepare them in our own special way. Buck's Pizza shops are most often 800 sq. ft. - 1200 sq. ft. store fronts located in small strip shopping centers, freestanding buildings or retail areas in small towns. Most of our shop locations are rented or leased by a franchisee rather than being purchased. Accessibility to residential delivery areas is a major consideration in the selection of a Buck's Pizza® location. The way product flows through your shop can save you many steps during the course of a busy day. Efficiency and productivity are equally important when we lay out your shop using the Buck's Pizza® equipment package. The equipment we provide is everything necessary for you to open a Buck's Pizza® shop. State and local health / building codes may require additional equipment beyond the requirements of Buck's Pizza®. We at Buck’s take great pride in preparing your pizza. Our family- owned franchises continue to gain loyal customers because we are committed to serving your family the very best. To learn more about the Buck's Pizza franchise opportunity simply complete the form below.